This week I have a special guest on Friday Feast. Fiona Lowe is an Australian author and previous Romantic Book of the Year finalist writing contemporary romances for Carina Press and Harlequin Mills and Boon. I had the pleasure if sitting next to Fiona at the Romance Writers of Australia conference awards dinner last month, when we shared a lot of laughs, chatter and cheers over champagne. Hardworking Fiona has THREE books out this September: Boomerang Bride, Career Girl in the Country and Wedding in Warragurra, part of the 3 in 1 release Australian Bachelors: Outback Heroes. Boomerang Bride is on my digital to-be-read pile and I look forward to getting stuck into what I’ve heard is a very satisfying small town romance. Honestly, you’d buy this for the heart-skippy cover and blurb alone! In town for his annual family visit, Marc Olsen had never seen a bride quite like Matilda-staring into a storefront window, holding a tottering wedding cake, and looking desperately in need of a groom. He may not have any warm feelings for his hometown, but meeting Matilda just as she discovers she’s been scammed by her online “fiancé” stirs something in him. Matilda is not the kind of woman Marc imagined himself with, and Marc is anything but the romantic hero that Matilda has always dreamed of. But as unlikely circumstances throw them together, can they let go of their misconceptions and risk their hearts for love? Now here’s Fiona with her Friday Feast. Enjoy! When I was living in Wisconsin, the land of deep fried cheese curds and ‘Brats in beer’, we spent a lot of summer weekends going to ‘cook-outs’. Held outside, with a gathering of friends and plenty of fabulous Wisconsin beer, it sounds much the same as the Aussie BBQ, and it was, except for the food. My contribution to these occasions was always to make and take a Pavlova. My US friends fell in love with Pavlova and I agree, what’s not to like? I fell in love with Ambrosia salad. 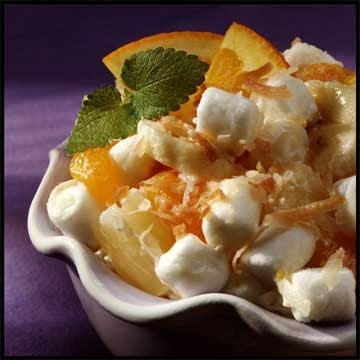 The first time I met Ambrosia salad, was at Thanksgiving and I thought the hostess had brought dessert out early. Turns out she hadn’t. This dish is often served as a ‘salad’ with the main meal, even though to me, the ingredients seemed more like dessert. However, I scooped it up and ate it and came back for seconds. After that I always looked for it at the BBQ’s and now I make it in summer at our BBQ’s and have lots of fun confusing my friends. Bottom line, either as a salad or a dessert, it tastes yum. 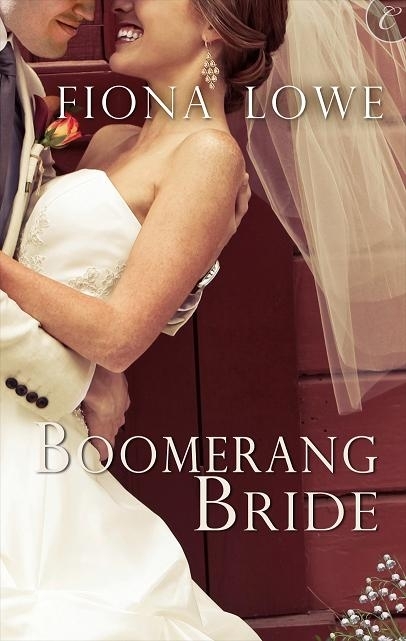 Matilda, the Aussie heroine in my fun contemporary romance, Boomerang Bride, is stuck in small town Wisconsin in a wedding dress, holding a cake and missing a groom. She has a similar Ambrosia Salad experience, although she uses her confusion to her advantage. I’ve had to adapt the recipe ‘some’ because not all the ingredients are available here, but it still tastes great and slightly more savory than the US version. Combine everything except the cherries in a bowl and gently fold through the sour cream. Put in a serving bowl and sprinkle with more coconut and decorate with cherries if you choose. Serve chilled. Enjoy! For more recipes, check out Fiona’s latest releases of Boomerang Bride and Career Girl in the Country. 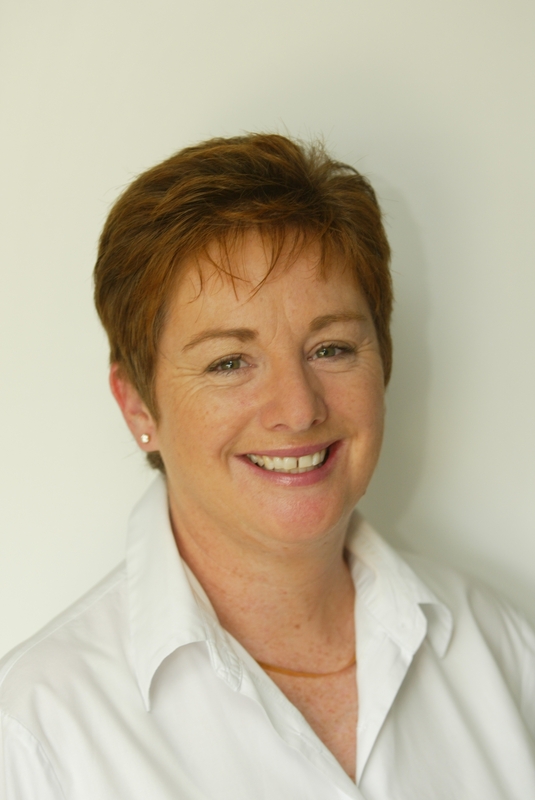 Fiona Lowe is an award-winning, multi-published author with Mills & Boon and Carina Press. Whether her books are set in outback Australia or in the mid-west of the USA, they feature small towns with big hearts, and warm, likeable characters that make you fall in love. When she’s not writing stories, she’s a weekend wife, mother of two ‘ginger’ teenage boys, guardian of 80 rose bushes and often found collapsed on the couch. A previous finalist in the Romantic Book of the Year award, she’s writing her 19th novel. She loves to hear from readers and you can find her at her website, facebook, Twitter and Goodreads. This entry was posted in Friday Feast and tagged Boomerang Bride, Fiona Lowe, Food, Friday Feast, Recipes on September 16, 2011 by cathrynhein.